Today has been one of my favourite tennis days of the year with so many great matches and exciting tennis moments to enjoy. 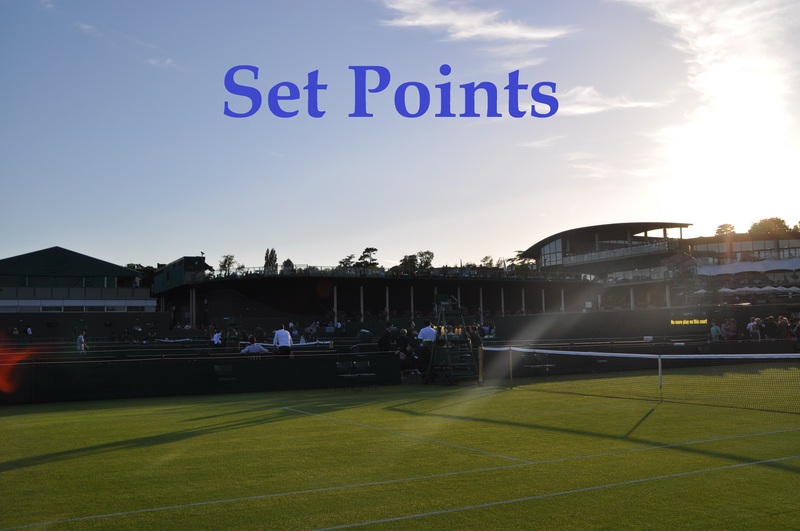 Therefore, this is the first of two recaps in a double header of Saturday’s Set Points! The first two winners on day 6 of the 2017 US Open were the world number ones in doubles and singles, and in contrasting fashion. First through to the second week from the top half of the draw was the world number one in doubles, Lucie Safarova with a super clean display, beating Kurumi Nara, 6-3 6-2. Safarova wobbled a tad, leading *4-0 *40-0 in the second set, but refocused from 4-2 and finished in style. Lucie played such an aggressive match and her forehand was PEAK at the start of the second set. There were some gorgeous angles and a stunning on-the-run forehand winner down-the-line. This was an ideal match-up for Safarova as Nara didn’t put her under a great deal of pressure so she was able to dictate and go after her shots. It was also nice to see Lucie win nine out of nine points up at the net. There is no doubt that her success in doubles has translated to her being more positive in singles coming forward. I’m thrilled for Lucie who is through to the fourth round of a Slam for the first time since Wimbledon 2016! Here’s the selfie from the screencap above. The world number one in singles, Karolina Pliskova battled through a forearm injury and against an at-times inspired opponent, saving a match point to beat Zhang Shuai, 3-6 7-5 6-4 in two hours and 20 minutes. An aggressive, Zhang had served for the match leading 6-3 *5-4. The Chinese player was clearly tight, yet did chalk up a match point – Pliskova saved it with a sensational forehand down-the-line. Full credit to Zhang who never threw in the towel after losing the second set and played her part in a thrilling third set. In the end, Pliskova was just a bit tougher mentally in the key moments. There was quite a roar from Pliskova at the end! The arm injury was certainly a worry for Karolina but hats off to her – I am mega impressed how she hung in there, yet came through for her second hard fought three set win of the week. One of many great points from the third set of Pliskova-Zhang. CoCo Vandeweghe had never previously won a set off Agnieszka Radwanska on hard courts in five previous encounters. The American turned the tables with a superb display to win, 7-5 4-6 6-4 in two hours and 56 minutes. I loved the contrast in styles and there were so many exciting points. Vandeweghe recovered from a slow, nervy start to win the opener, 7-5, serving out the set at the second time of asking on her fourth set point. I was surprised how patient Vandeweghe was from the baseline and I felt she was zoning in on the straight sets win. Vandeweghe chalked up a break point at 4-4 in the second set. However, Radwanska held on and then pounced with a forceful return on set point after Vandeweghe had hit back-to-back double faults serving at *4-5 *40-15. The decider went to and fro – the quality wasn’t always there but it remained fascinating to watch. In a four deuce game at 3-3, Vandeweghe broke with a huge forehand winner. It proved to be the pivotal break as Vandeweghe consolidated with a big hold and then shook off a few nerves at the end to serve out the match to 30. 🇺🇸's @cocovandey tops Radwanska and books herself a spot in #USOpen Round of 16! The WTA has gone OTT in my opinion on Aga hot shots – this though was totally legit! Jennifer Brady has bookended her Slam year with last 16 showings at the Australian Open and US Open . Fun stat alert – Brady’s seven main draw wins at WTA level in 2017 have all come at the Slams! Brady was ultimately rewarded for her positivity in a 6-3 4-6 7-6(3) win over Monica Niculescu in two hours and 26 minutes. I watched most of the third set and it was so much fun. Brady’s net charging against Niculescu’s passing shots was a fun dynamic. Chuck in Niculescu’s forehand slice, some wicked drop shots and Brady struggling to stay on her feet and it was wild! Brady played a great third set tiebreak and won a trio of points up at the net. Note Brady was laughing while on the floor! Love this shot of Brady from the WTA’s Instagram page. September 2, 2017 in Set Points, US Open, WTA. Hopefully Brady will be an easy win for Karolina. Regardless, she’s showing what Kerber never quite could as #1 and that’s fighting like a champion. We’ve become all too accustomed to watching Serena battle through her off days to see the top ranked player give in limply… so it’s great to see Karolina step up. I still think that this title is on her racket if she wants it enough. That’s quite rude towards Kerber bc I feel that she wants to win but she was just so unsecure the whole year. I don’t see Pliskova winning the title. She was lucky enough with the draw and her performances. Also she seems very passive to me atm. Have to admit I’m puzzled as to what’s happened to Angie. I keep expecting her to snap out of and start playing again like she did in 2916 but so far it hasn’t happened. I’m wondering now how well Karo’s arm is going to hold out; she’s clearly been suffering from it over the last couple of matches. Nice hug at the net between Shelby and Elina; it was a good match and although Elina won, Shelby pushed her hard at the end. 2916 lol; I meant 2016! No offence but Pliskova has played better in this tournament than Kerber ever did as #1. Did you watch the Gibbs or Zheng matches? She dropped sets against women who were playing inspired, lights out tennis. It’s no disrespect to Kerber. A lot of the girls at the top of the game have struggled this year when their opponent has gone into beast mode. Halep, Svitolina, Wozniacki, Kerber, Kuznetsova. Only really Muguruza and Pliskova seem to be so mentally sound that they can swing it round. If this is true that would be weak bc Pliskova was awful in this tournament tbh. Imo Kerber was playing great until Singapore last year when she was No.1. After that (in 2017) she could not play free probably bc she took too much pressure on herself. It didn’t help either that she didn’t have much of an off season bc of sponsors and other media stuff which you have to take responsibility of as No.1. Statistically Pliskova is certainly not playing “awful”. Her serving stats are great, her winner count is healthy and her unforced error count is tidy (As tidy as you can expect from her playing style). To top it off she’s been convincing at saving break points (71% against Zhang and 78% against Gibbs) and clinical at taking them (50% against Zhang and 67% against Gibbs). So I’m afraid you’re gonna have to show me some receipts. She was awful for her standards. Luckily for her it was enough. I think you agree with what I’ve said to Kerber? No, I don’t. She was made #1 after the US Open and didn’t have a good tournament until the Year End Championships in Singapore, which is the only time she’s really looked like the top player at an event. And she still lost. Then we will see if Pliskova will be a top player and win a (big) title as No.1. I don’t see that if she doesn’t win the US Open bc then she will probably lose this position. I’m also really hoping Safarova upsets Coco. She has the game and I think her game suits these courts more than Vandeweghe’s does. If she goes in feeling like the underdog she could do it.